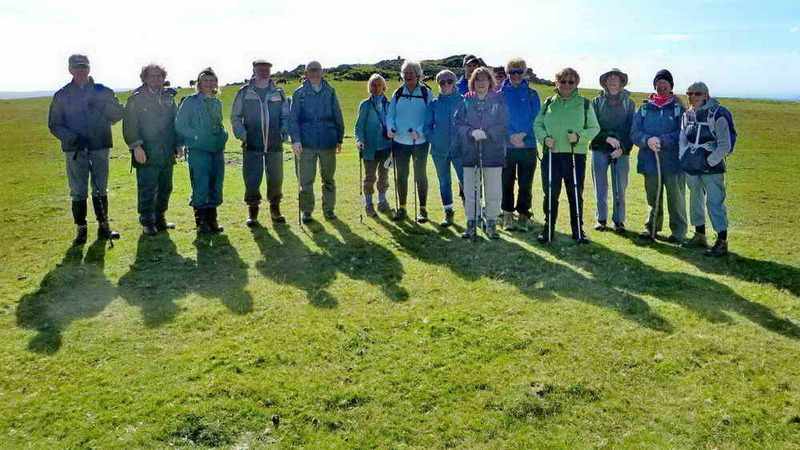 Seventeen DPA members and friends met at the Pork Hill car park on Tuesday 25th September for the walk up Cox Tor Hill and the return between the tor and Roos and the Staple Tors. The weather was excellent- blue sky and sunshine all morning. 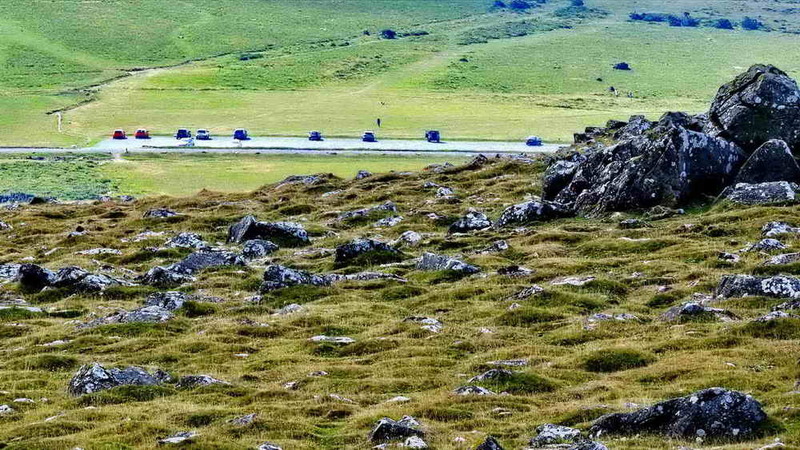 The photograph above shows a somewhat zoomed photograph of Cox Tor, but although rocks can be seen “at the top” they are not the tor – this is a false summit. 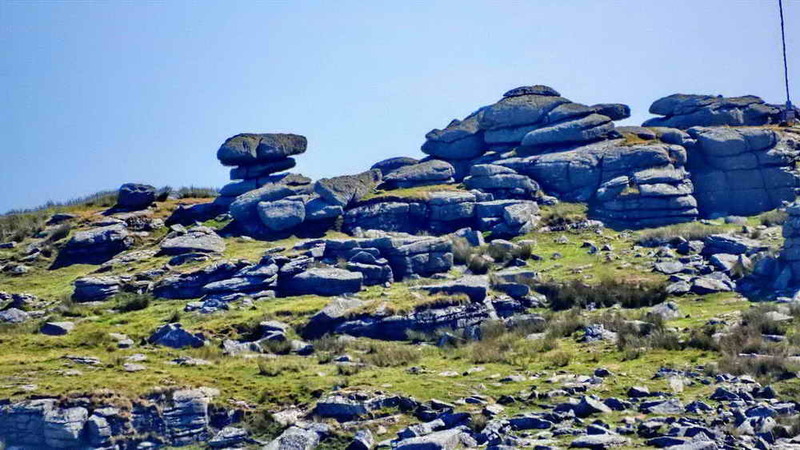 The rocks seen are exposures of the bedrock, which is not granite but dolerite in this area, with the real tor hidden behind them. 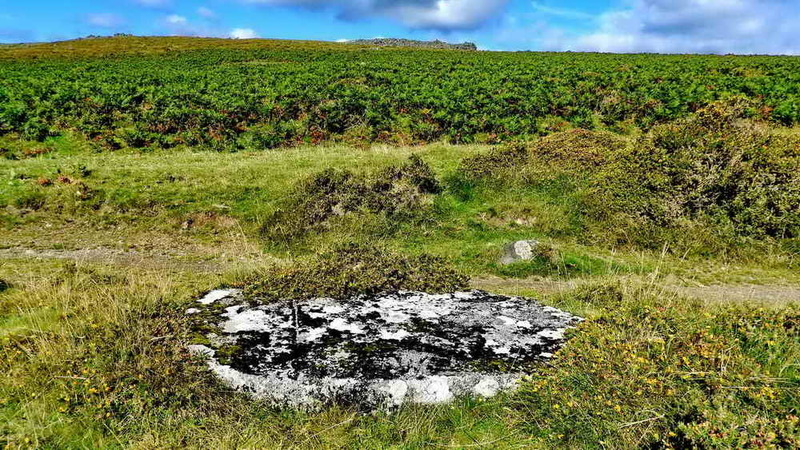 This tor is part of the metamorphic aureole that of metamorphic (“altered”) rock that was affected when the molten magma welled up to form the granite batholith underlying Dartmoor, Bodmin Moor, West Cornwall and the Isles of Scilly. There are two large areas of exposed rock which we went around on the way to the top. 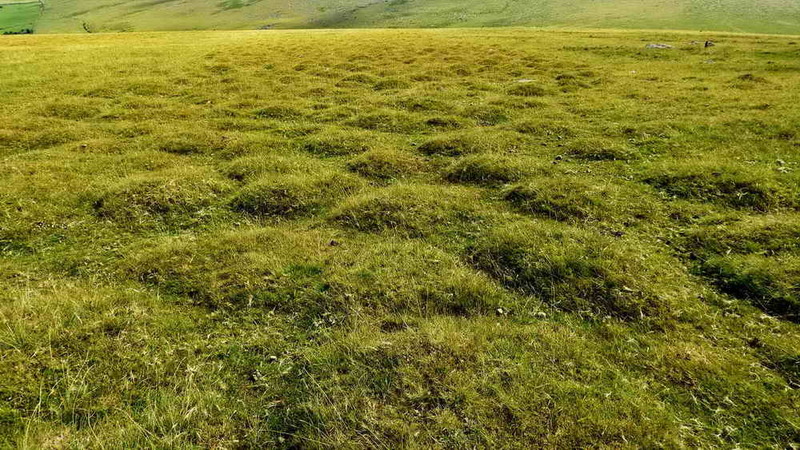 Once the top of the hill is approached, you notice that the ground is covered in small humps: these are thufurs. 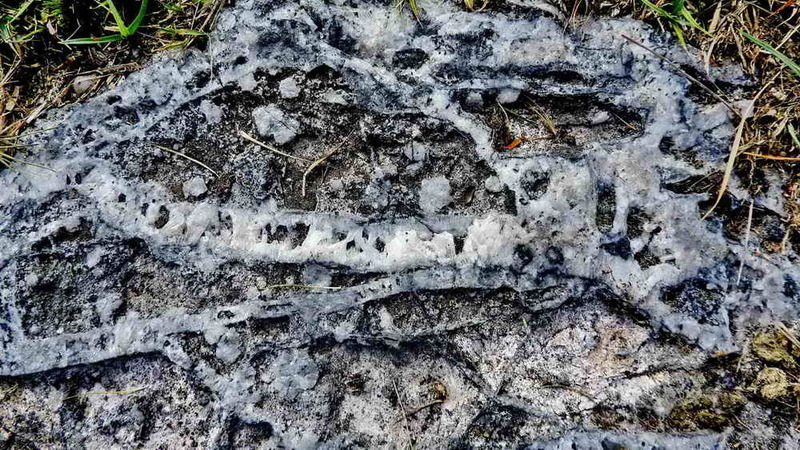 These have been thought to be molehills or covered clitter stones in the past but are now said to be formed during periods of being near to glacial conditions, by repeated freezing and thawing, combined presumably with ice crystal growth resulting in pronounced, widespread “frost heave“. These are visible when zooming in on Google Earth (or Google Satellite View). 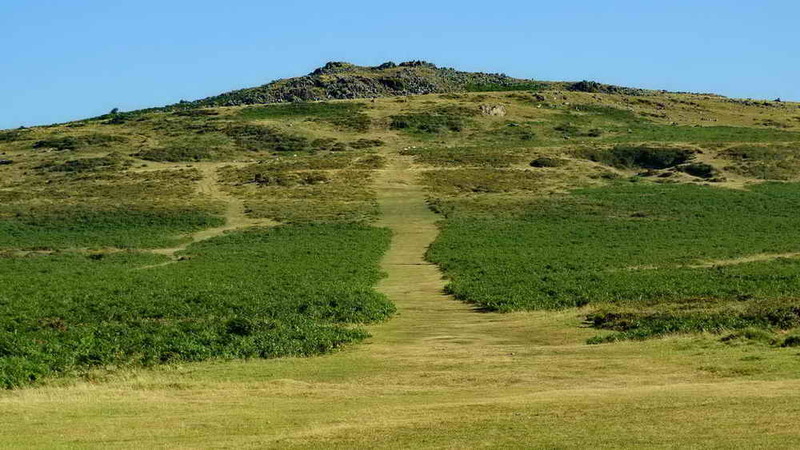 The summit of Cox Tor is an exposed tor but it has been largely covered by stones to form a Bronze Age cairn. 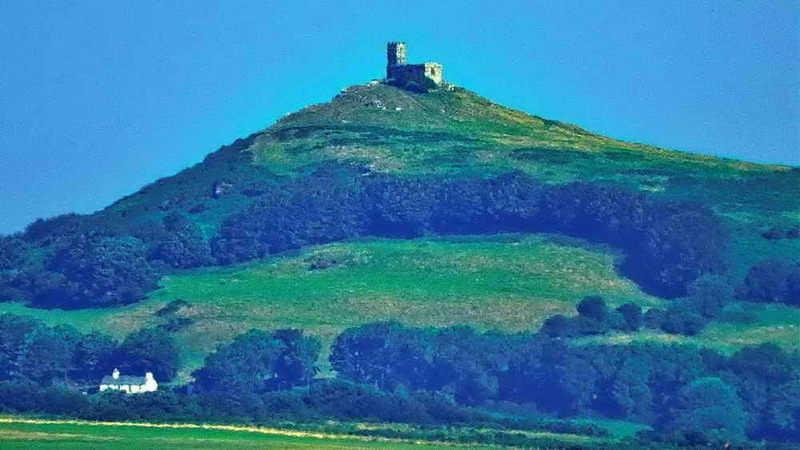 There is a triangulation pillar on the tor and the view above shows the rocky exposure that is seen from the car park. The car park can be seen immediately left of the exposure, with a zoomed view in the next photograph ….. The car park and the left edge of the rock exposure are clear in the photograph above, which was taken on a reconnaissance walk. The group will face the sun for the next group photograph. 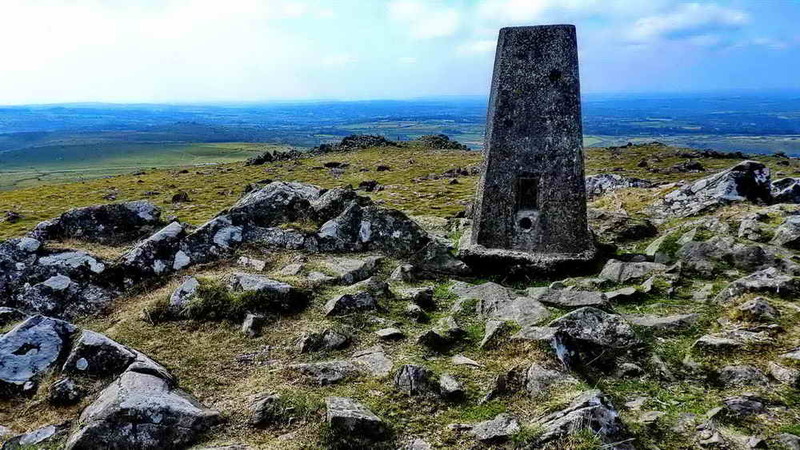 The summit of Cox Tor Hill offers a complete panorama of distant views, the one above being the volcanic plug that is Brent Tor or Brentor, with the church on its summit. This is 7 km (4.2 miles) distant. 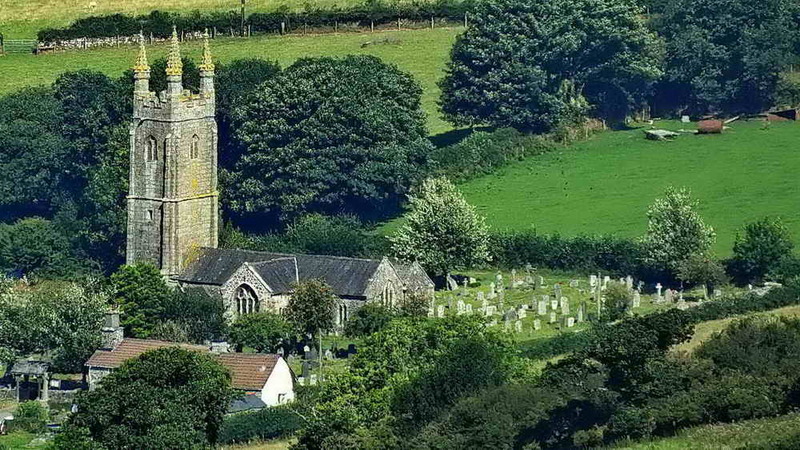 From an appropriate part of the summit area, the Church of St Mary, Mary Tavy, can be seen. This is where William and Emma Crossing are both buried. This is 1.9 km (1.2 miles) distant. 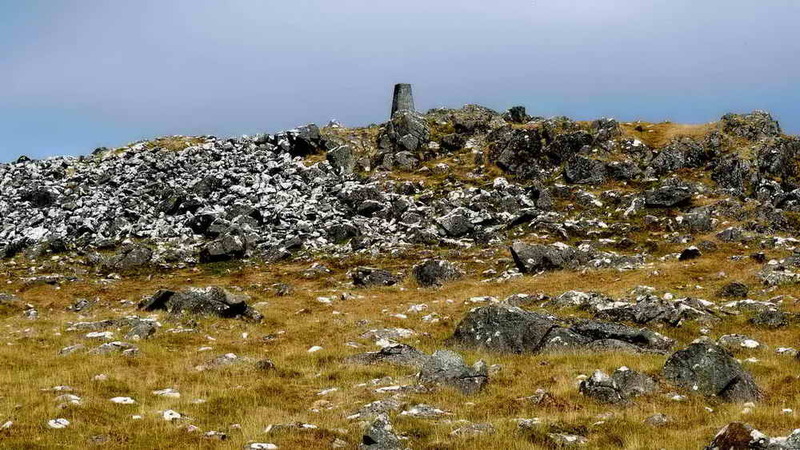 The Logan Stone on Roos Tor is seen above with the MOD Firing Range flagpole at the extreme right. 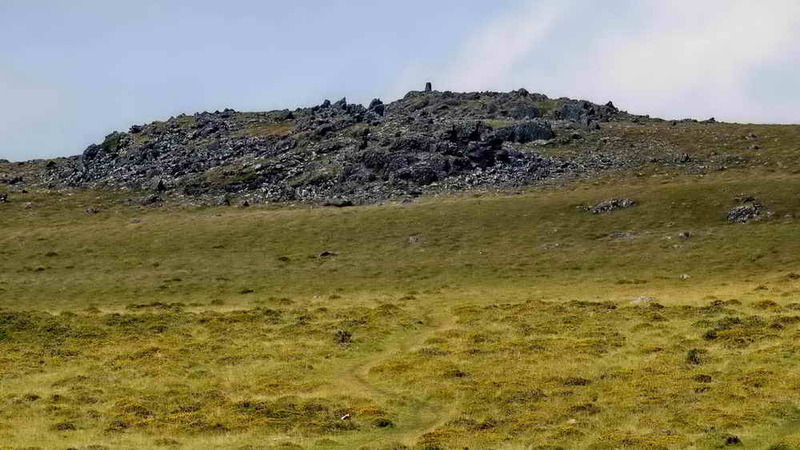 The top of Cox Tor Hill is quite a large, plain area that is marked by a large cairn (above) with a smaller one not far away, besides the actual tor and its cairn. 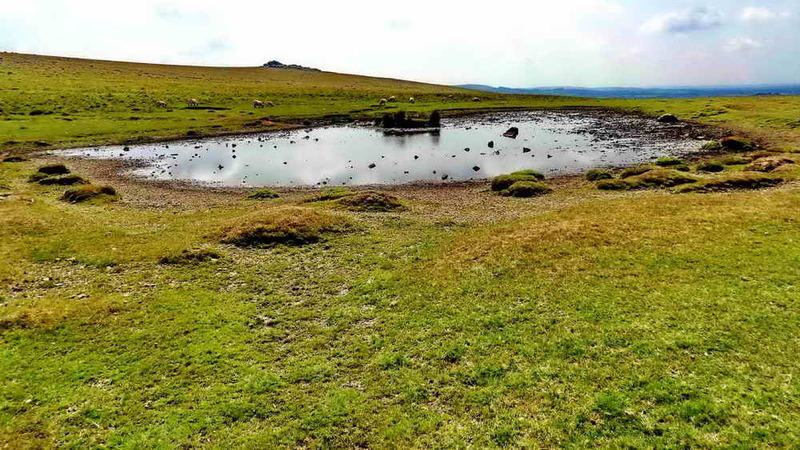 There is a pool in the col between Cox Tor and Great Staple tor. The tor in the photograph above is Middle Staple Tor. There is a whitish-coloured stone in the ground between the pool and the Quarrymens’ Path which is a bit of a comglomerate with crystalline veins, presumably it is dolerite? 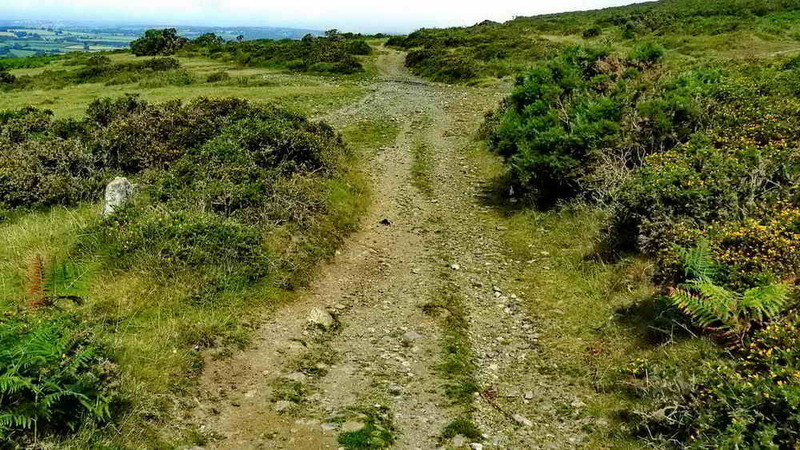 The Quarrymen’s Path runs through the col between Cox and Great Staple Tors, connecting Pater Tavy and Merrivale Quarry. It was built by the quarry workers to help them find their way in mist and darkness. It was built of handy moorstone laying nearby. Further along, where moorstone as absent, they lined the edge of the path with broken crockery which, it is said, they could see in the dark! 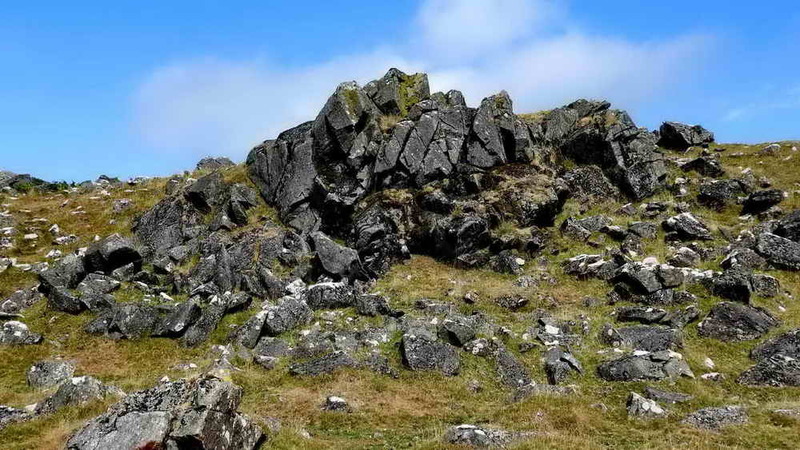 The photograph above shows the main rocky exposure as well as the near-summit exposure behind which is (mostly) hidden the tor. A PW stone lies beside the track between the pool and the car park, at SX 53460 75960. 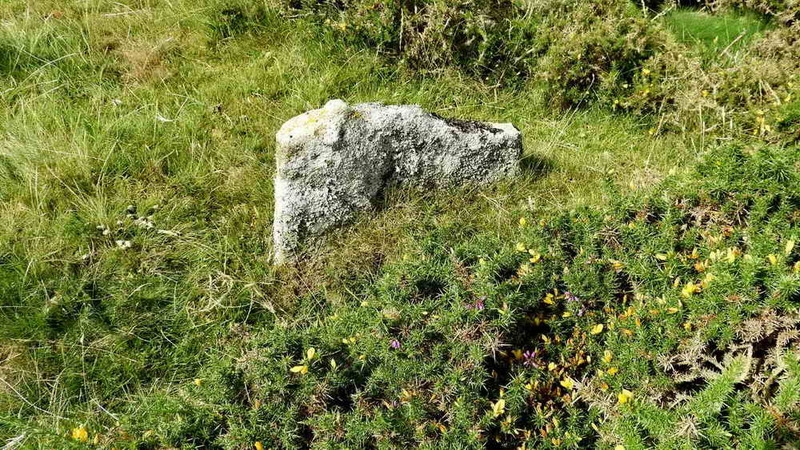 This is a marked parish boundary stone between the parishes of Peter Tavy and Whitchurch …..
At the top of the photograph is an inverted “W”, signifying Whitchurch Parish, and a “P”, signifying Peter Tavy Parish – both indicated by yellow pointers. On approaching the car park, we turned right, around the base of the hill, to see the first stone or two in a line along the parish boundary. 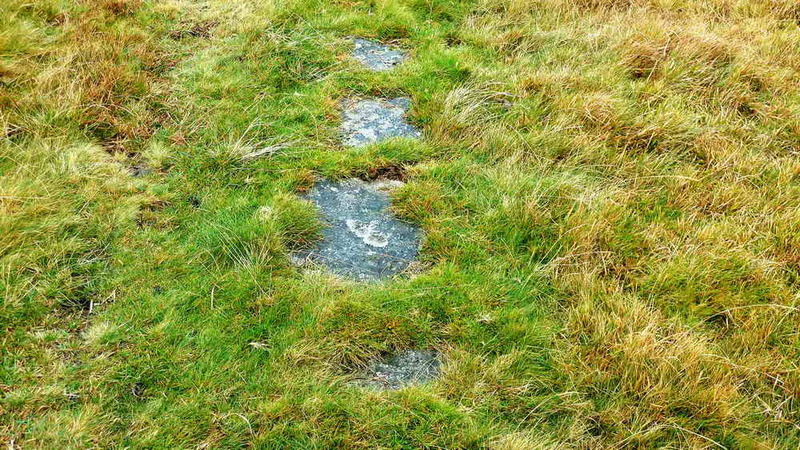 These are the RB stones, of which there should be seven, with the one nearest Coxtor Farm being lost may years ago. They are shown on the 1843 Whitchurch Tithe Map (see top right corner, at approx. “7 o’clock” to the “DEVON 1843” caption). 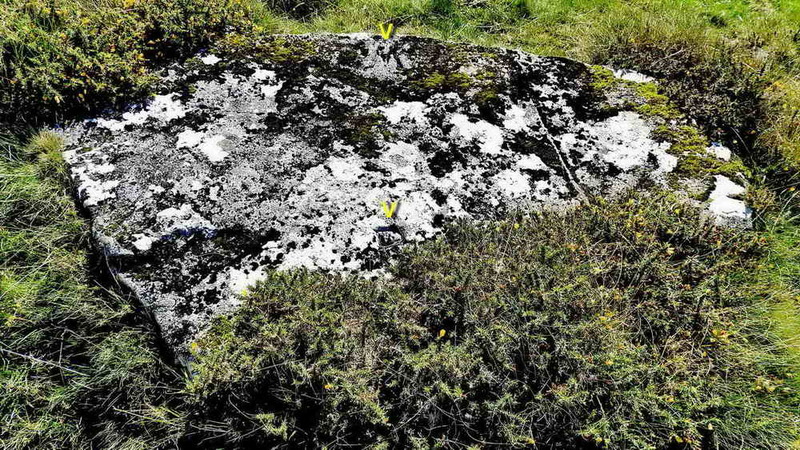 They are also on the 1884 25-inch OS map – zoom in to bottom left corner to see them – this shows them to be on the boundary between the parishes of Peter Tavy (to the north) and Whitchurch (to the south) …..
A closer of the first RB stone encountered, shown above, at SX 52836 75392,. RB has been found to signify Radcliffe Bounds, these being a family that once owned six farms in the area. This photograph, taken 5th October 2011, is included here because the object is, or was, a great rarity – a wood-and-stone gate, now defunct. It is the moor gate at Coxtor (farm), at SX 52171 76240. 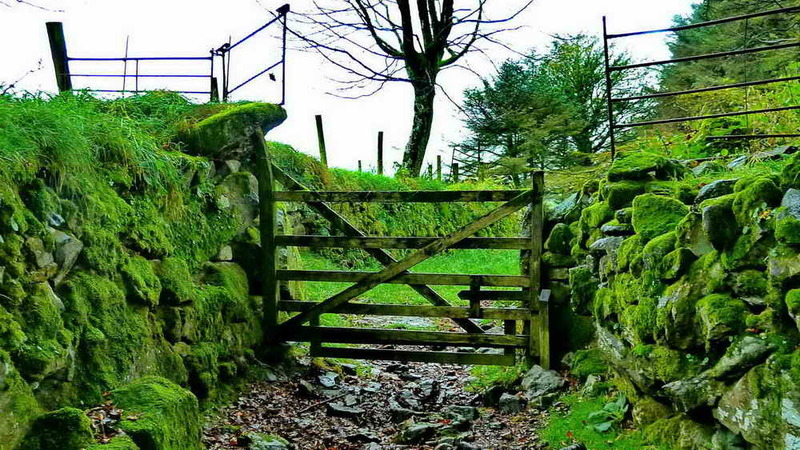 It is believed to have been the last working gate of its type, having an upright (“hurr”) that sat in a stone with its elongated upper end swivelling in another (“gate hanger”) stone. In this case, the upright went right through the stone. The closing end upright is the “head” of the gate and the top bar is the “back”. The diagonal members being called “braces”. We then returned to the car park from where those who were lunching proceeded to The Plume of Feathers, in Princetown.